Modern humans were present in Southeast Asia about 20,000 years earlier than previously thought, according to new evidence published in Nature today. An international research team led by Macquarie University applied new archaeological techniques to a longstanding question - were the human teeth discovered more than 120 years ago from Lida Ajer cave really modern human? 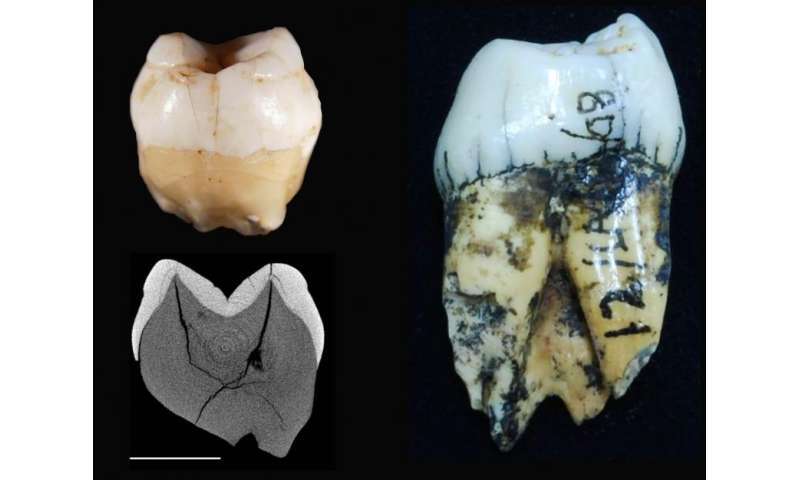 The techniques allowed us to identify and date ancient human teeth from this Sumatran cave. These teeth are the key to understanding when humans first travelled through the region, and provide the first evidence of modern humans in rainforests. It was a journey that eventually led humans to Australia. The Lida Ajer cave, in the Padang Highlands of Sumatra, was originally excavated in the late 1880s by the Dutch scientist Eugene Dubois, who found two human teeth. He was already famous for finding "Java Man", the first evidence of a missing link between humans and other great apes. But the evidence had been ignored when considering the path of human dispersal out of Africa and across to Asia, mostly because ofr doubts over the age and identification of the teeth. Our study aimed to establish a solid age for the evidence and test whether the teeth did indeed belong to a modern human. The hardest part was trying to find the cave site again, almost 120 years on from Dubois's excavation. We only had a sketch of the cave and a rough map from a copy of Dubois' original field notebook. It took myself, Rokus Awe Due from the Indonesian Centre for Archaeology, and many locals more than a week of constant searching. We stumbled across the cave almost by accident. The minute I saw a large rock column in the entrance, I knew we had found the cave dug by Dubois many years earlier. It was important to find the cave again to sample the sediments in which the fossils were found. That way we could make sure that resulting age was reliable. To establish the importance of this evidence we used advanced modern dating techniques and state-of-the-art imaging methods to confirm the age and identity of the teeth. These techniques would not have been available to Dubois. The tooth analysis allowed us to look at the internal structure of the teeth, exposing the enamel thickness and the junctions between the enamel and dentine. These junctions are crucial for distinguishing modern human teeth from other ape teeth such as orangutans, and other much older human species. We applied a range of different dating techniques (luminescence, uranium series and electron spin resonance dating) to improve the accuracy of the fossil age. As the techniques measure different events, such as the last exposure to sunlight and the timing that cave rock deposits were laid down, any agreement between techniques indicates the resulting age is likely to be solid. Our results indicate that the human teeth were laid down in the cave between 73,000 and 63,000 years ago, implying that modern humans were living on the landscape at that time. The evidence from the fossils in the cave suggests that the modern humans were living in a rainforest environment. This is surprising because the oldest previous evidence of rainforest use by modern humans in Southeast Asia was from 45,000 years ago. 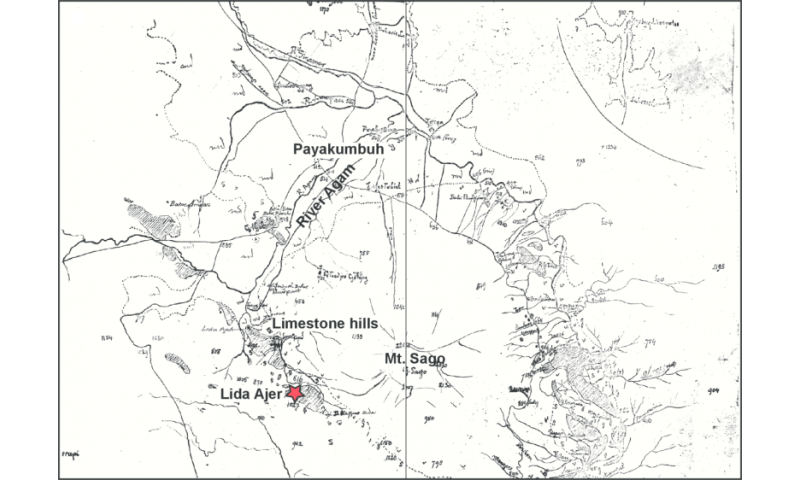 This cave site, shown on the map above, is not within the accepted route of modern humans dispersing through this region, which is considered to be more to the east of Sumatra or closer to Borneo. It was thought that modern humans preferred a coastal route and yet we now have evidence of modern humans inland in western Sumatra. "Living in dense rainforests requires complex hunting technology and knowledge that the first humans out of Africa would not have possessed and yet we find evidence of modern humans in rainforests as soon as they arrived in Southeast Asia." Perhaps the conditions at the coast were not suitable for survival? It's hard to imagine what the coast of Sumatra would have looked like. The sea level would have been between lower than today so this evidence would now be under water. But we do know that surviving in a rainforest is difficult as it requires complex planning to find and secure enough food. The Lida Ajer evidence indicates that by at least 60,000 years ago, modern humans were capable of rising to this challenge. So what does this mean for the first Australians? If modern humans first arrived in Southeast Asia nearly 20,000 years earlier than previously accepted, then why did they wait until 60,000-50,000 years ago before crossing over to Australia, as was previously thought? Our study suggests that modern humans could potentially have made the crossing earlier. Recent work from northern Australia confirms this to be true, with evidence that humans have been living in the Madjedbebe cave site as early as 65,000 years ago. So were the first Australasians much quicker at getting from Africa to Asia, much better at adapting to new environments, and much better at exploring new areas than we previously thought? This evidence seems to suggests so, and indicates that Southeast Asian caves may have many more surprises left to uncover.